Pumpkin is an excellent source of nutrition, and I love using it as an ingredient in many homemade baby food recipes. However, when I first starting using this filling harvest fruit, several questions did crop up. Here are some tidbits I've learned after experimenting with pumpkin baby foods. When Can My Baby Have Pumpkin? Really the sky is the limit. I've added pumpkin to yogurts and infant cereals, swirled in purées of bananas, blueberries, and peaches, topped it over cooked lentils, and mixed it in with chicken to make the meat more palatable for my picky baby. Just be sure when you do mix pumpkin with other foods, that your child has already shown no adverse reactions to the food by itself. How Do I Select Pumpkins? You want to look for pumpkins that are labeled baking, pie, or sugar pumpkins. They all mean the same thing, but depending on where you are located may go by different names. These pumpkins have the best flavor. I prefer pumpkins that are between 5 to 8 lbs or 6 to 8 inches in diameter. Smaller pumpkins tend to taste sweeter and are easier to work with as they are more tender and don't have as many seeds and strings. 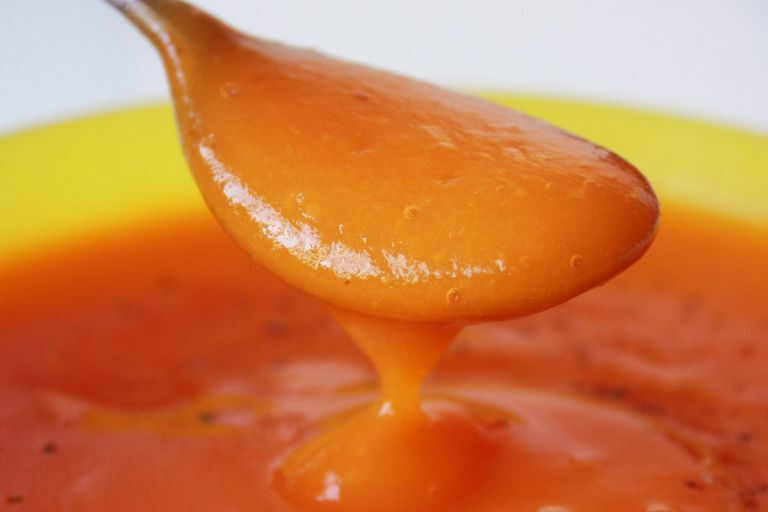 How Do I Cook or Bake the Pumpkin for Homemade Baby Food? You can prepare pumpkin in much the same way as you prepare other fruits and vegetables - steaming, poaching, boiling, or baking. I prefer to bake pumpkin in baby food recipes. Baking seems to help retain the richest flavor of the pumpkin as well as keep the nutrient value at its highest. Also, pumpkin itself contains a great deal of water and methods like steaming, poaching, and boiling seemed to make the pumpkin far too wet. Honestly, you don't need a lot of fancy equipment when it comes to making baby food, especially pumpkin. A baking pan and fork will suffice for mashing the food, though a food processor certainly will make a quick mash. If you want to freeze your pumpkin, ice cube trays, freezer storage bags, and a permanent marker will be all you need. Can I Feed My Baby Canned Pumpkin? If you are short on time or don't feel like baking your own pumpkin, you certainly can use canned pumpkin. However, just be sure that you are using plain canned pumpkin. Pumpkin pie mix is not suitable for babies as it is loaded with sugars, spices, and other additives. You also should be aware that canned pumpkin does not have the nutrient value of fresh or frozen pumpkin. Pumpkin will brown when exposed to air. This doesn't mean the pumpkin is no good. However, you can prevent some browning in your homemade baby foods in a few ways. Shortly after you cut the pumpkin and remove the seeds, bake it. After you have made the purée or cube it for finger foods, either use it immediately or freeze it. Pumpkin, in both forms, freezes and thaws nicely.